Hello crafters! I am thrilled that you are joining me today, as I am a guest for the Altenew May release blog hop! 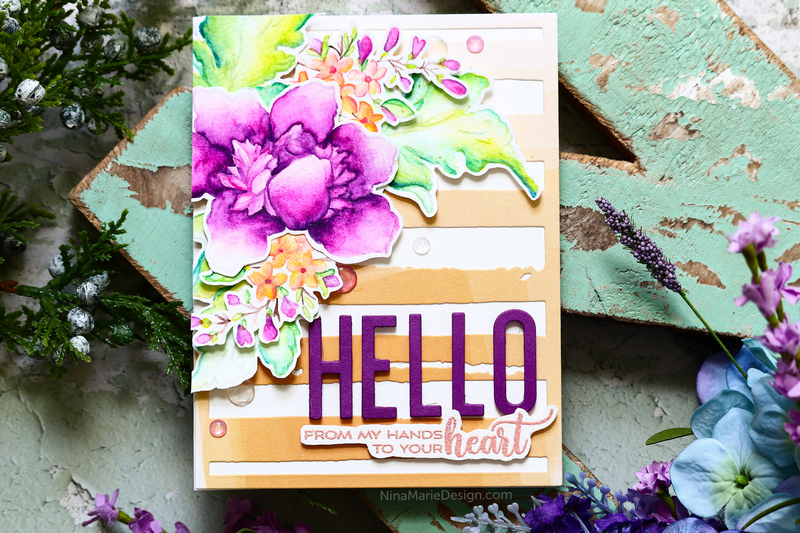 I am featuring 4 different ways to use the latest stamps and dies from Altenew, and I hope you love these products as much as I do! If you have already been hopping along, you should have arrived from Nicole Picadura’s blog. You can reference the Altenew Card Blog for the entire hop list. 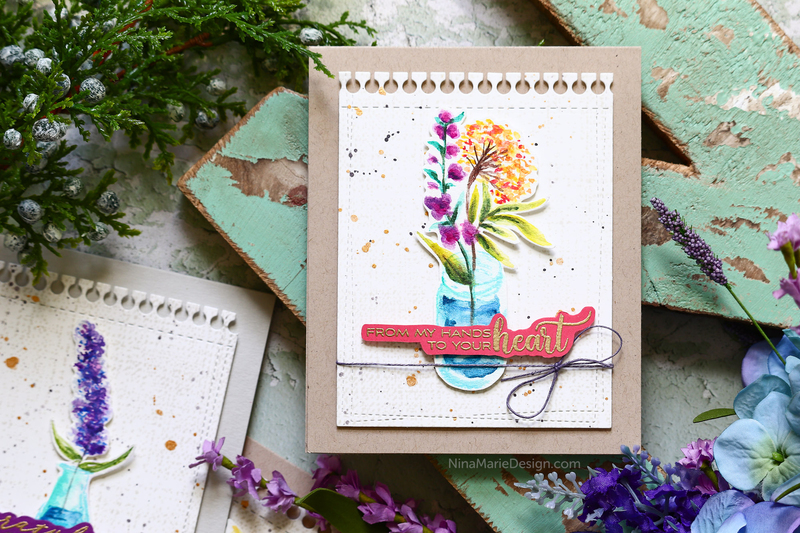 My first card using the new release is this bold, Fabulous Florals arrangement! 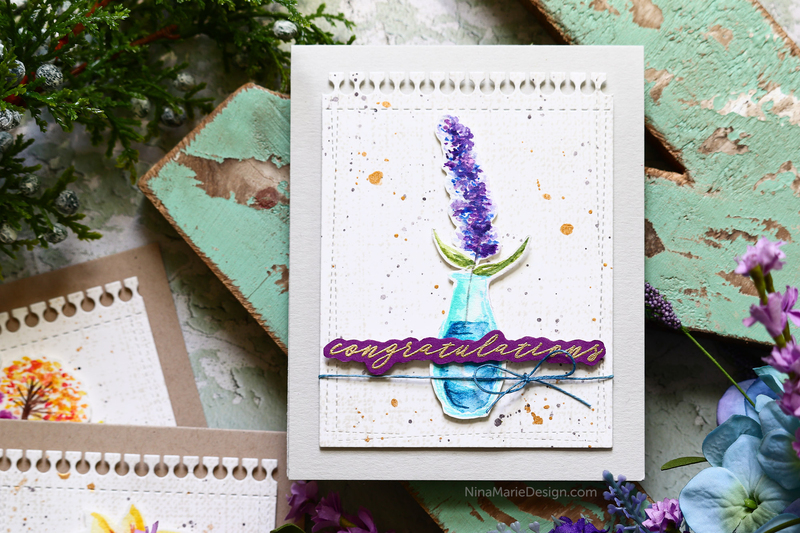 These pretty stamp layering images look so pretty in the non-traditional color scheme I incorporated into this card; the navy is acting as a neutral in the design. I also incorporated a few die cuts from a previously released set called, Create a Wreath. Those were tucked in and around the florals. I also snuck a few Satin Rainbow confetti sequins around for some extra pops of color. 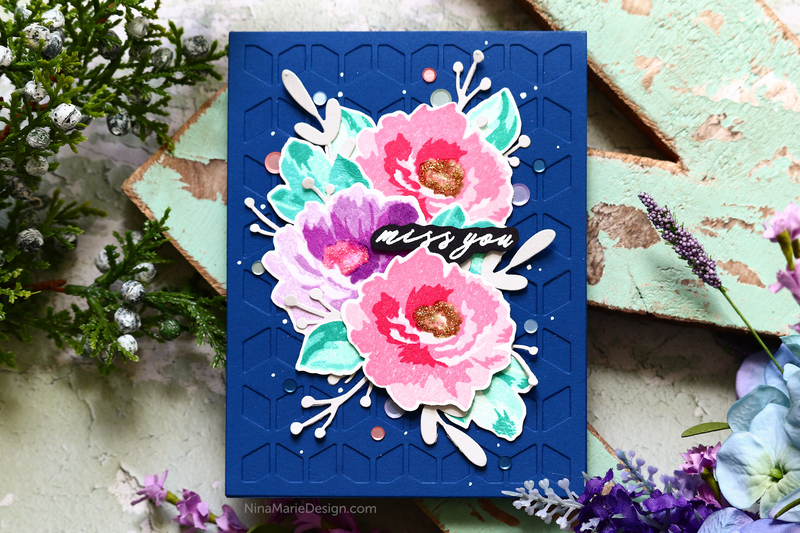 All of the floral elements are layered onto a navy card base that is cut using the Cube cover plate die. This is a subtle way to add texture to the background! Finally, I added a sentiment onto the card using a greeting from the Garden Silhouette stamp set. 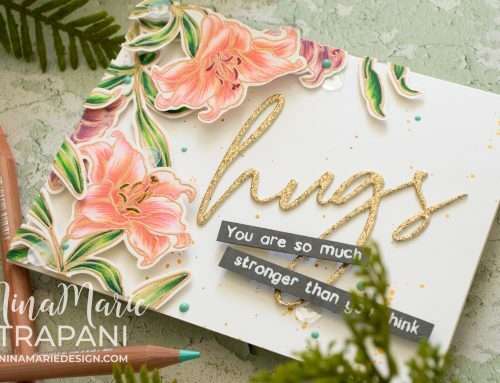 You can see how this card came together by watching the video at the top of this post! 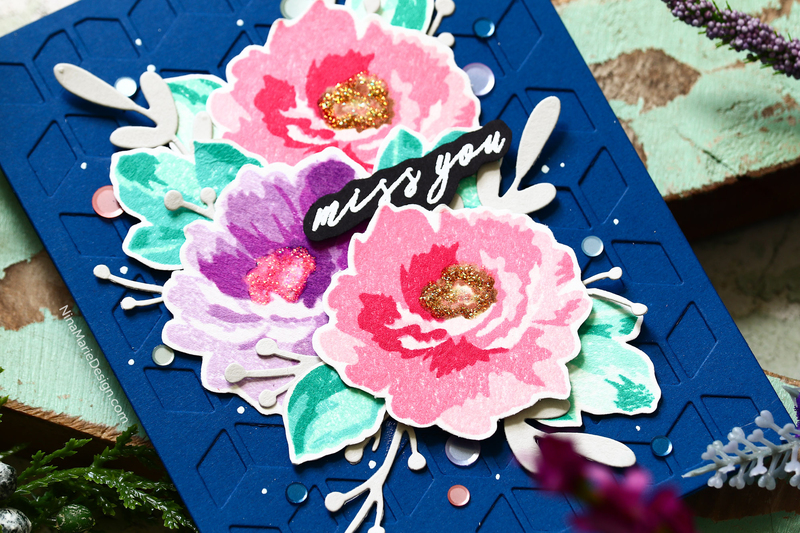 This next card features the stunning Crown Bloom stamp and die set; aren’t these florals beautiful? I used the Ink on 3 Fadeout ink and Prima Watercolor Confections to do some no line coloring. After coloring the florals, I used the coordinating dies to cut the images out. I also die cut the background with some Pinkfresh Let Your Heart Decide paper and Atlenew’s Watercolor Stripes cover plate die. Those awesome die cut letters are from Altenew’s Fine Alphabet set; I cut them four times to create extra depth and dimension to the sentiment. 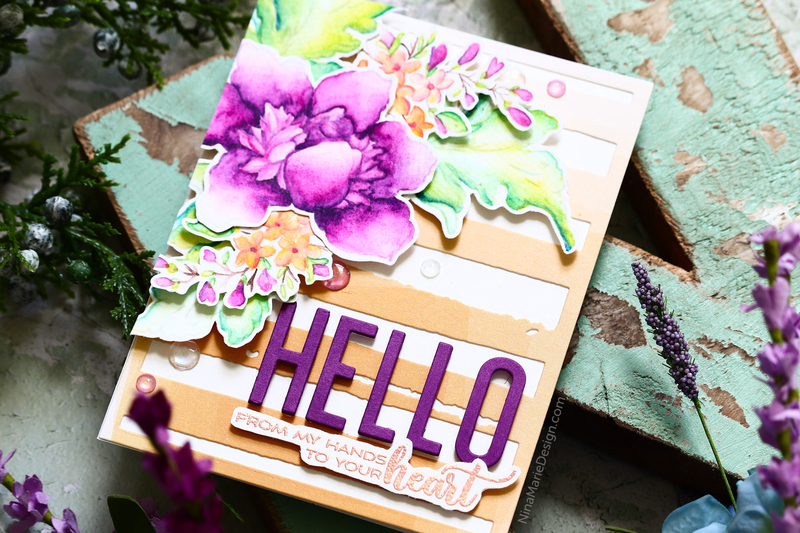 There is a supporting greeting added underneath the “hello” word using the Rustic Linen stamp set. Finally, I finished off the card using a few sequins that I tucked here and there around the florals. 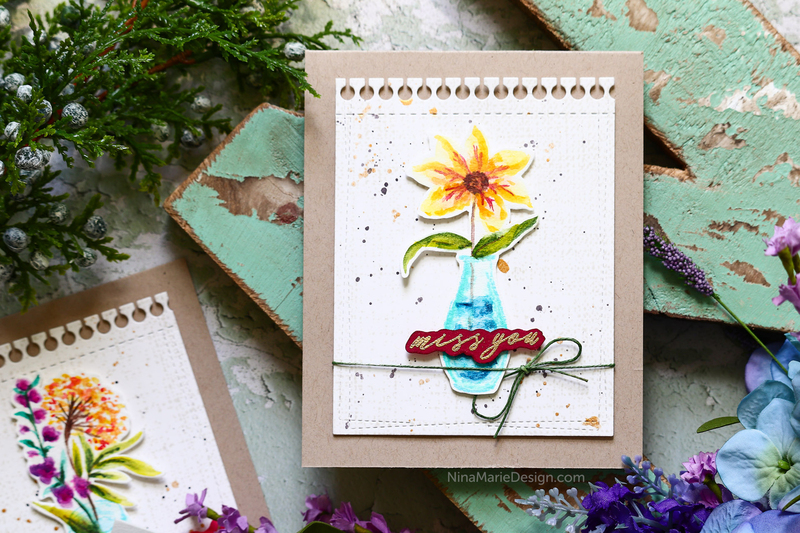 My last card to share today is actually a set of three, no line watercolored cards using the Garden Silhouette stamp set. 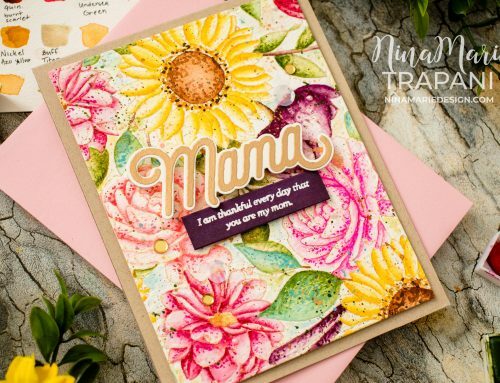 These images are so pretty and can be stamped either as true silhouettes, or in a very light ink and colored over (which allows you to get one-of-a-kind floral arrangements)! 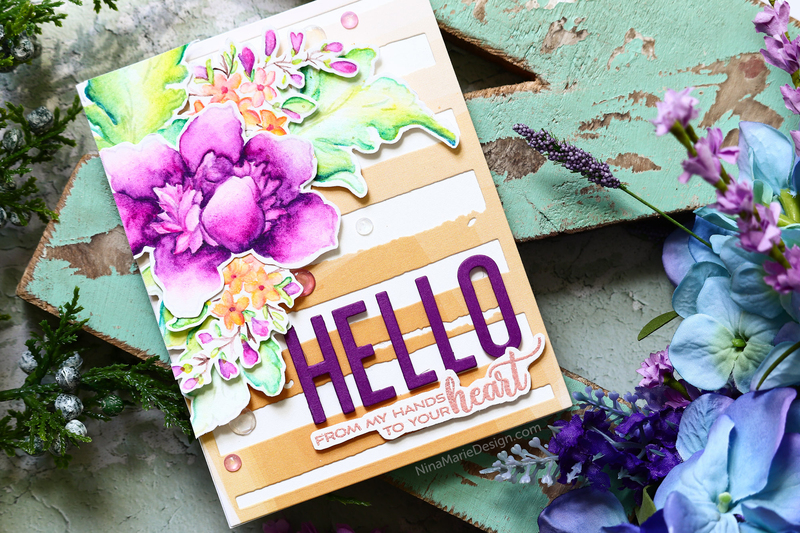 The florals are stamped in super pale shades of Simon Says Stamp inks. I then watercolored each arrangement with Prima Watercolor Confections. Behind each floral is a panel stamped with the new Rustic Linen stamp and the Notebook edge die cut along the top. I kept the cards very clean and simple to let the watercoloring shine and added just a few subtle embellishments; a twine box (custom colored with Copics to coordinate with each card), sentiments from either the Garden Silhouette or Rustic Linen stamp set, and some splatters of gold watercolor. These elegant and minimalistic cards can easily be altered to fit any ocassion. They would also make a great set of cards to give as a gift! 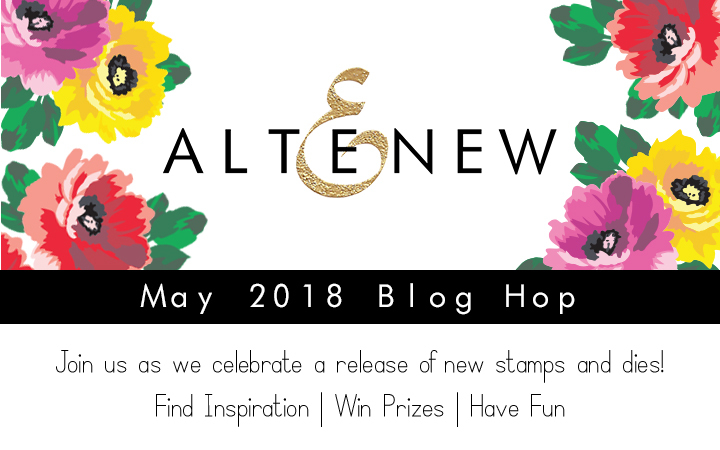 I hope you enjoyed all the inspiration I shared today for the Altenew May Release Blog Hop! 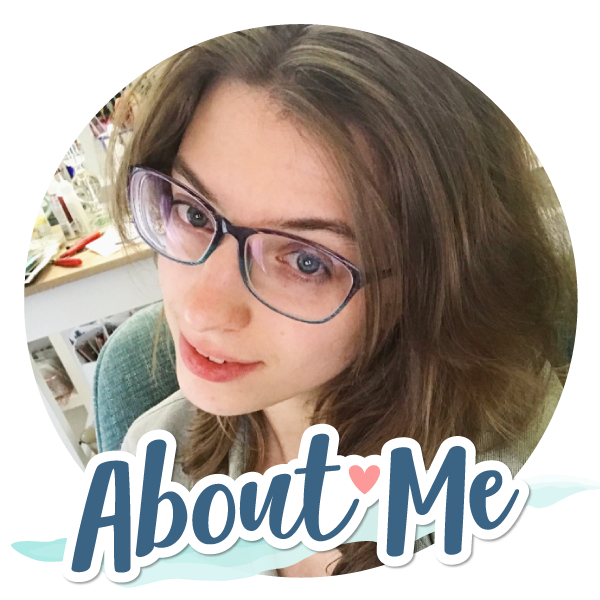 Be sure to continue along to the next stop, which is Terhi Koskinen’s blog. You can also visit the Altenew Card Blog to see the entire hop list! Remember that you can win one of six $50 gift certificates to Altenew’s store! Please leave a comment on the Altenew Card Blog and/or Altenew Scrapbook Blog by Friday, May 26th for a chance to win. The six winners will be announced on the Altenew blogs on May 27th. You could also win a $30 gift certificate by leaving a comment here on my blog! Please leave a comment by Friday, May 26th for a chance to win this certificate too. 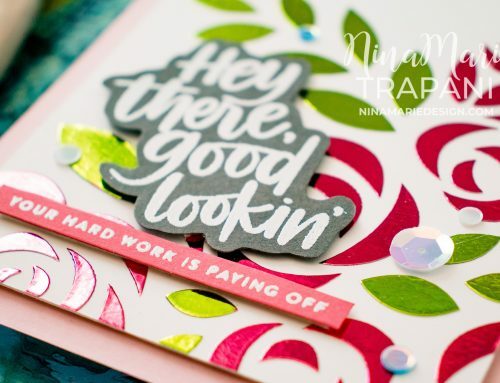 Your cards are amazing, Nina Marie! That first card with those gorgeous flowers on the navy background is absolutely stunning! I loved each and every card…your creativity is awesome!! Your cards are all amazing!! I love the new Altenew release! Beautiful cards, as usual! I love the blue background on the first one. Your color combinations are so unique and really stunning! So stunning!The crown bloom watercolor card made me so glad! Fantastisk work! The navy background on the first card is a great idea. Love all of your beautiful card creations! Enjoyed watching your technique video too. These cards are wonderful. The design and layering in the From My Hands to Your Heart make such a beautiful combination! Purple is one of my fav colors! Love these! Beautiful cards. I really like the blue background on the first one. I love the blue card color on the first card, but I really love the Hello card colors you used. Oh my!! So amazing! 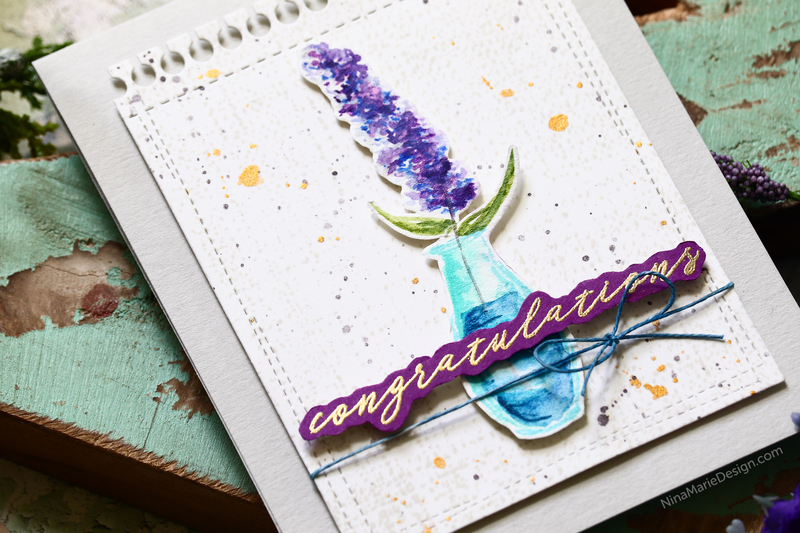 The way you die cut your backgrounds/used colored cardstock/the purple in your flower and die…on and on. I’m just amazed at the beauty you created with Altenew’s new release. In awe!! Thanks for sharing! So many cards! So many ideas!! Love them all!!! I always love your creations! Always colorful with those little extra touches. Wow, love all your cards! Awesome Nina you really did a wonderful job! Bright, colorful, cheerful, beautiful designs! Don’t want to forget very creative with touches of Wow!